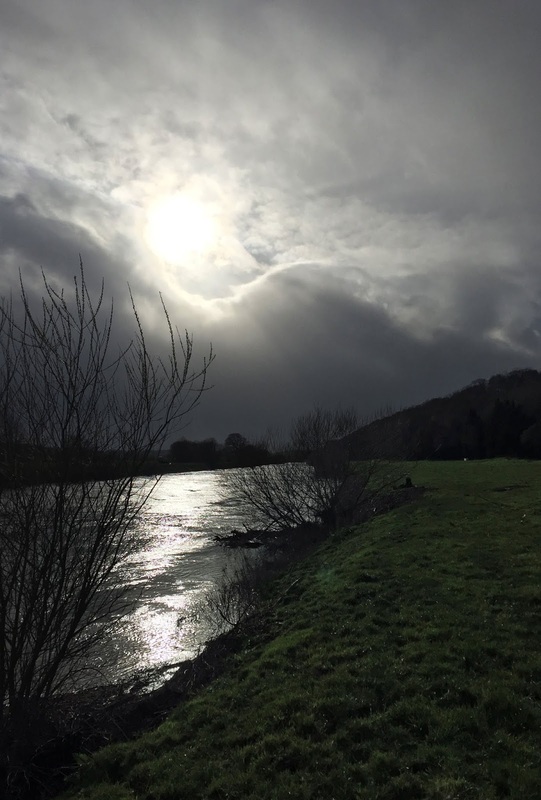 With only one days fishing available to me across the closing week of the season, there was only ever going to be one candidate, the River Wye and all of it's beauty and splendor. A booking via the WUF would see me on a beat that I had been trying to pull a double figure fish from for the last couple of seasons. Home to plenty of long lean summer fish, I'd always struggled to retain the same sort of catching form over the autumn and winter months and 9 lb 7 oz was the tantalizingly close best so far. My winter form wasn't helped by this not being a particularly great floodwater beat, with very limited near bank cover. 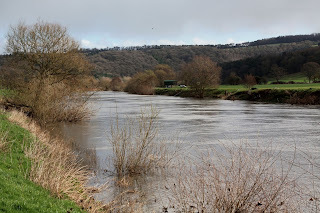 It was with some concern then that I watched the weather forecast in the build up to Sunday and to watch river levels rocketing across the Midlands. 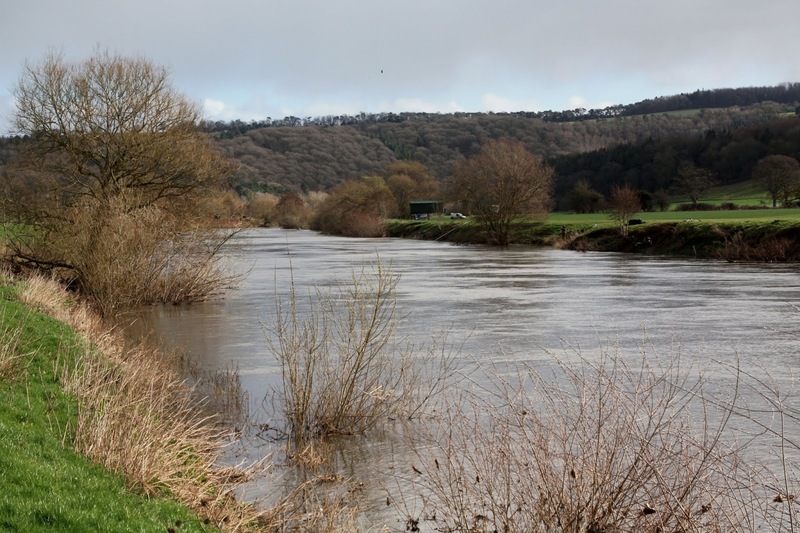 By the time I woke on Sunday morning, the river levels at Ross on Wye were 2 m, 60% higher than levels I knew to be unfavorable for the beat. However, with the tickets booked, an email from the WUF stating that a wash-off required fishing to be technically impossible; and the reality of cancellation meaning more decorating, I decided to give it a punt. My partner for the day would be Nick Fisher, and it would be good to have a catch-up with him, even if the fish didn't join us. Spring! and the welcome sight of sunshine! And so, in the early hours of Sunday morning as my alarm rang out, I leapt out of bed, threw on my winter wet weather clothing and packed the car quickly and quietly. A quick cuppa brewed in a thermos mug and I was away. The weather was abysmal. Pouring rain and howling wind was definitely 'go back to bed' weather but with a little encouragement from tea and heated seats, I made it down the M50 to my beloved River Wye. By arrival the weather had turned and I greeted Nick in a farmyard bathed in sunshine. 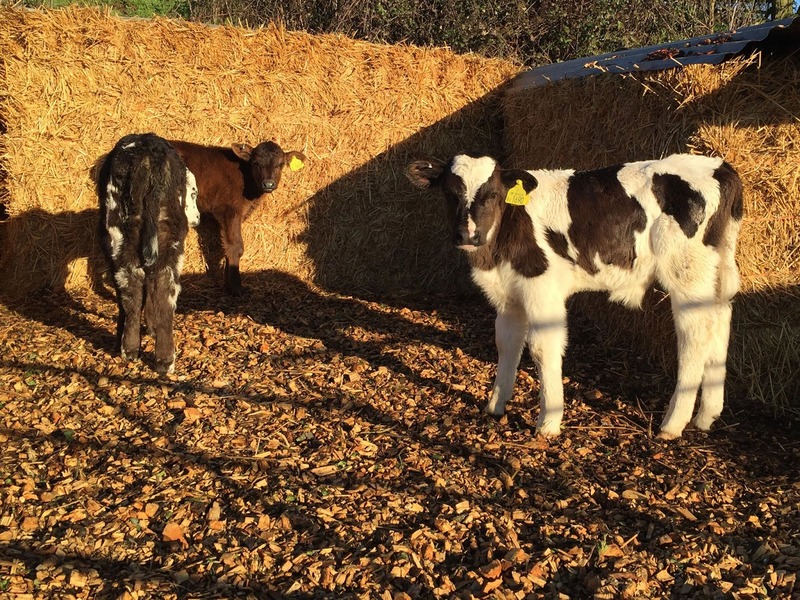 With calves inquisitively peering across the farmyard the morning had a real sense of Spring about it, and gave me a faint sense of hope that the weather might not be such a challenge after all. 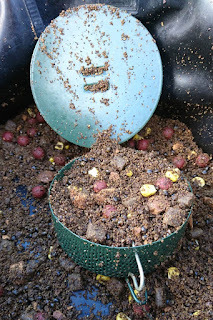 pellet with some free offerings on PVA string, whilst Nick would try a bunch of lobworms downstream of a heavy feeder. We would then both put a rod out in front as far into the flow as we could manage, using 5oz grippa leads and a bow of slack. Keeping with the theme of different baits I opted for an 18mm Krill boilie with matching paste and Nick two 10mm ambush pellets. With the swim baited we took the opportunity to get the peg well established and took a walk of the beat to identify a few potential options for later in the day. Suffice to say that the rest of the morning on the bank was wholly unproductive. With rods cast in we were managing to hold in the flow, but without so much as a touch. 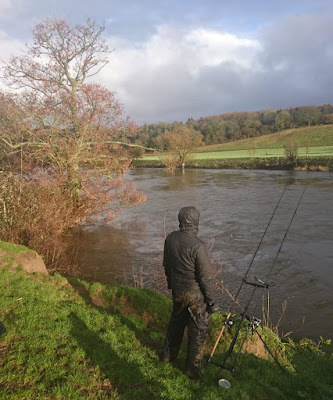 The same was true of the anglers on the opposite bank a couple of hundred yards downstream and it was evident that we needed to ring the changes. As a quick rule of thumb, if barbel aren't finding you, move to find the barbel. This is more true on a cold and flooded river than in any other condition. With fish lethargic from a sudden influx of cold water or simply sheltering from the flow, it was evident that they were not confidently foraging. So, selecting a few likely looking swims upstream, Nick and I set off to try and force a fish in difficult conditions. At each likely location one of us would target the slack sheltered water immediately downstream of a feature and the other would roll a lead round underneath from upstream. Within less than an hour we had covered three likely looking lies. It was on the third, right at the top end of the beat that we finally had some interest. Within minutes of Nick rolling a 14 mm ambush pellet under a tree his rod wrapped round and the first fish of the day took off for the flow. With his clutch set a little more loosely than necessary it was apparent that Nick was going to need to up the pressure to keep the fish from the snags and drag it back upstream against the flow. With a few minor adjustments Nick was back in charge and quickly slipped the net under a fish of around the 6lb mark. Not the double we had come for, but a very welcome fish in difficult circumstances, hard fought and well earned. A few casts into the same swim failed to produce another fish and we moved back down the beat towards our original peg, retrying each of the previously baited spots we had fished en route. With the sun shining, a clearing sky carrying the vivid colors of summer and without another fish we decided it was time for lunch and retreated to the stove for bacon butties and soup. Make it happen! If the barbel don't find you... find the barbel! With one eye on the bottom end of the beat, we decided to give our original swim one last attempt whilst we cooked and ate lunch. The fish (if any!) 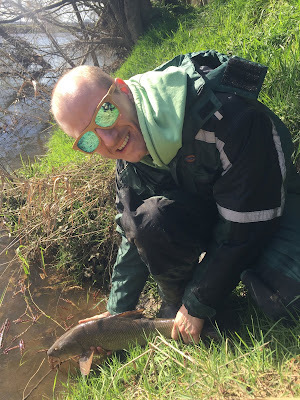 had been left undisturbed to get their head down on the bait and it was a surprise when my mid-river rods responded despite being nowhere near the baited area. The deftest of tugs on the rod was followed by a slackening of line and I assumed a snag had dragged the lead out of position. 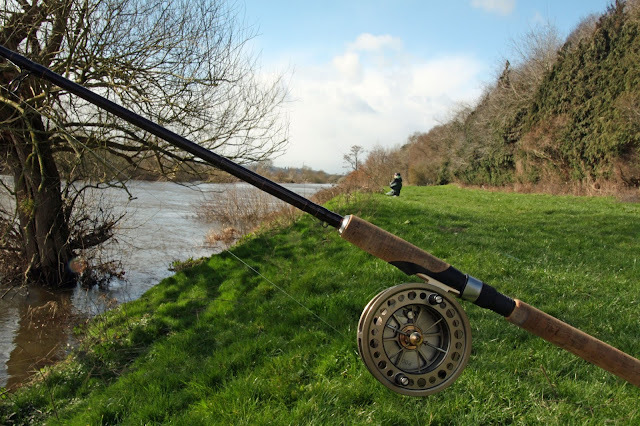 I picked up the rod in readiness for the flow to arch the rod over, which it did in a slow controlled snag-like fashion. Giving it a short sharp 'just in case' strike I began to reel in against the flow. To my amazement I felt the unmistakable shake of a fish on the other end. Using a 5 oz lead and a carp rod just to hold in the flow, I can't say that it was a fight to remember, but it was a fish I wouldn't even have connected with on lighter tackle. A second fish of around the 6lb mark meant that neither of us had blanked. 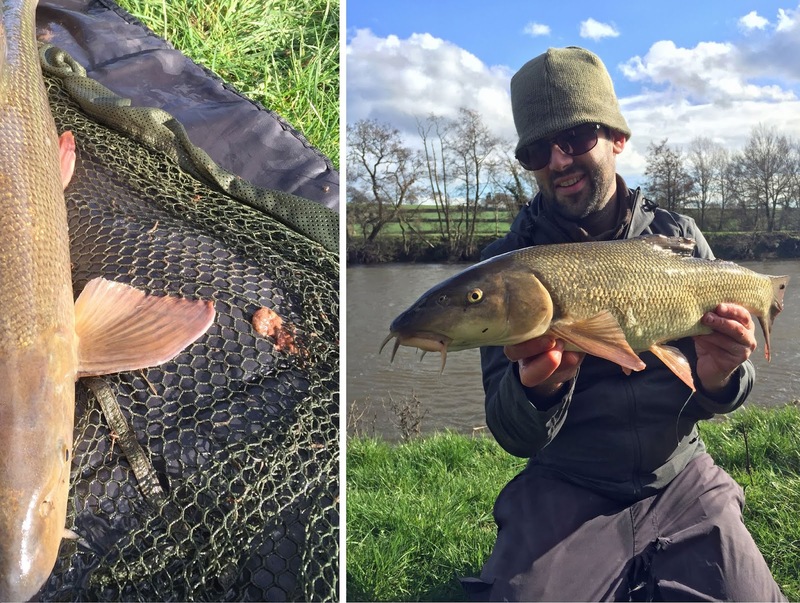 Barbel being fickle creatures, I've always maintained that any day with a barbel on the bank is a good one! With a fish on the bank from mid-river, we decided to give it another 30 minutes at our original location before making our way downstream to explore the bottom end of the beat. Recasting the rod as far out into the flow as I dared, Nick and I took turns watching the rods whilst we packed away our gear into the car, leaving us with just the essentials for the remainder of the afternoon. A handful of spare leads and terminal tackle, and the last of the seasons bait... to be applied liberally into any likely looking bankside swims. With no further inquiries the rods were withdrawn and we headed downbeat in what was still a relatively sunny day, albeit an increasingly windy one. The first peg we came to with accessible cover was a little too close to anglers on the far bank. Whilst neither party could have fished more than a rod length out given the flow and streamer weed that characterizes mid-river, it felt like we'd be poaching fish from under there noses. 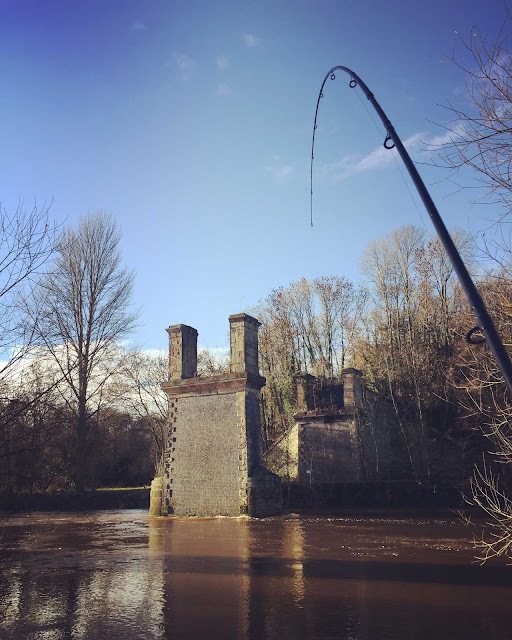 I'd have certainly felt a little aggrieved if two anglers had arrived to fish just short of opposite us, and with this in mind we carried on down. The next swim offered Nick a pair of willow bushes to fish between and a mature tree for me to roll a lead under. I also cast out into the flow, entirely expecting to snag in the streamer weed. Both of us felt we had positioned ourselves on the available features for the stretch and that if barbel were present and on the mooch we'd stand a chance of picking one up. However, with half an hour gone, not so much as a twitch and some menacing looking clouds on the horizon, we decided to carry on down to give ourselves enough time to give the lower beat the effort it deserved. By the time we arrived at the penultimate stretch, the rain clouds had overtaken us, thoroughly soaking us in the process. were to design a barbel swim, other than adding a weir (or perhaps a beer garden), I can't think of a single feature that this stretch doesn't have. Upstream the river shallows before narrowing and deepening creating oxygenating turbulence. This is followed by a deep pool, constrained at it's lower end by a salmon croy. 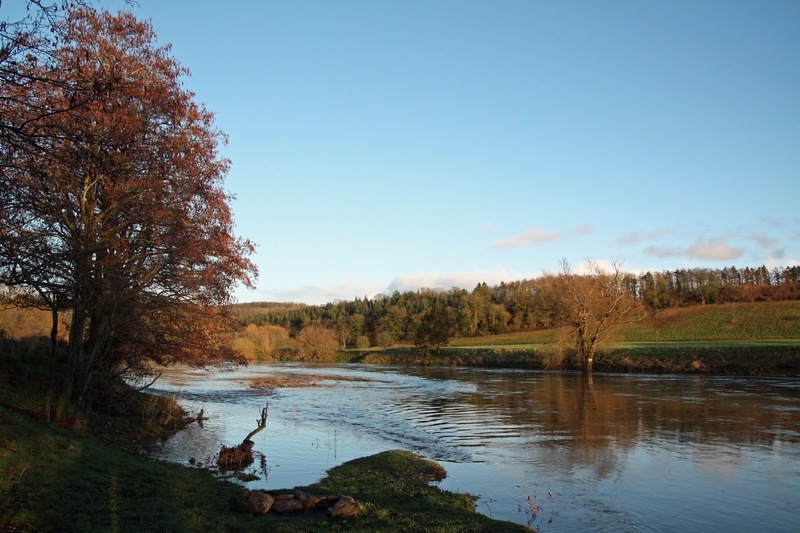 As the path of the river is forced around the croy, it passes under a beautiful oak tree, and through another deep pool. This pool empties via a fast deep channel which runs a few hundred meters along the far bank, with a shallow pebble beach to the near side. Of course in these conditions, the peg looked very different indeed and none of these features were visible beneath the dark muddy water. A map of these features in my mind though was all that was needed to identify the areas to cast to. We targeted the deep pools either side of the salmon croy. This provided deep sheltered water, with immediate access to fast flow and felt like our best bet of a final fish. Within a a few minutes of casting the weather had changed dramatically and mother nature was reminding us winter was not yet behind us. Nick had spent all day warning of the hail that would arrive later in the afternoon, something I'd written of as a myth some hours previously. With the horizon disappearing as a wall of white approached us, we hunkered down to fish through the storm. Combined with the howling wind, being out in the hail was akin to being shot blasted. Any attempt to turn into the wind resulted in oversized beads of ice pinging painfully of of the face. Usually hail storms are short-lived. This particular vortex of joy lasted for some 45 minutes, alternating between hail and snow. Good waterproofs served us well, but neither of our gloves held out and cold wet frostbitten hands would prove a real challenge for our last hour or so on the bank. Decent waterproof gloves will definitely be the next purchase for my fishing wardrobe. Ouch! Being reminded we're still in winter by a good shot-blasting from Mother Nature. It was during this hail storm that Nick struck into a determined rattle of his rod tip, presumably from a chub. Striking into thin air, it felt as if a final chance had been missed. Even so, and with the storm having blown itself onwards towards anyone mad enough to be fishing the Lower Severn at Gloucester, we moved onto one final spot. 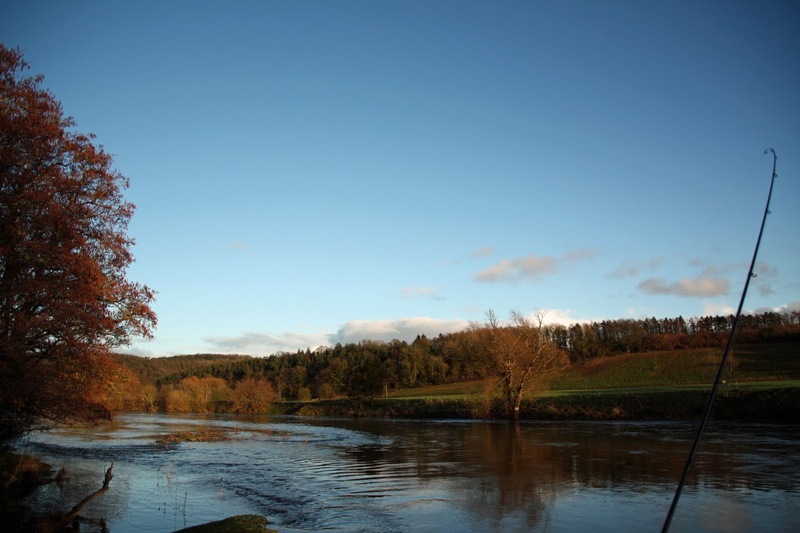 The Wye - Looking somewhat Autumnal! Our final peg then was to fish over the flooded pebble beach. Our thinking was barbel might move over the gravel to feed on invertebrates hidden amongst the newly submerged pebbles beneath the floowdwater. It was a longshot, especially with the flooded beach shallower than expected. Any attempt to cast into deeper water resulted in the 5oz leads heading swiftly in the direction of Monmouth. We weren't lucky enough to tempt another fish, but the riverbank had taken on a beautiful coloration in the setting sunlight, almost autumnal with reds and golds and yellow hewed greens.Weather-wise, this has been the strangest season I've known on the river, from the baking summer and low oxygen levels, the early autumn and spring; to the sudden final cold snap as winter tried to grip on a moment longer. 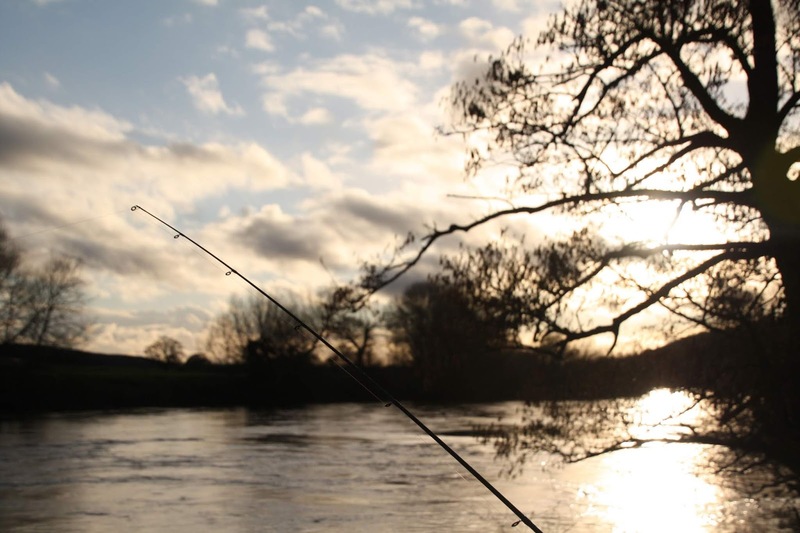 It was fitting perhaps that my last trip of the river season should have featured a little glimpse of each season; and as the sun set, my mind was already thinking towards June and targeting those abundant long lean summer barbel! The sun setting on another wonderful season on the UK's Rivers. Some cracking pics, really sets the scene !! Thanks Mick! Much appreciated! Taking the camera out with me has certainly added another dimension to my fishing! Love this! Fair play for getting out. I wimped out Thursday when I saw 3 meters on the gauge! Roll on the 16th. I don't think even I'd have ventured out on Thursday! It was looking savage! Will be glad when June comes around, but we've now got tench season to look forward to! Thanks for the great read. Sounds like you had a good time! Good luck next time out. Thanks Wes! Really glad you enjoyed! Tight Lines! Thanks Adam! 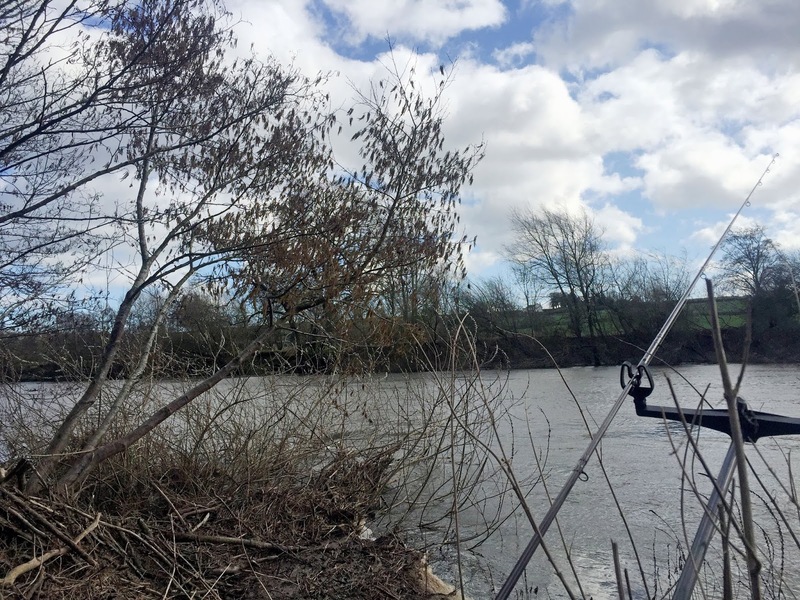 Really enjoying the blogging now and it's great to have a record of time on the bank to look back on! Click any image to see progress!